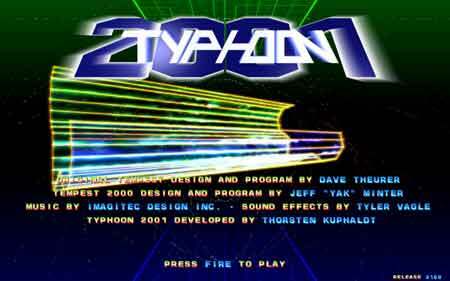 Typhoon 2001 is a Free game that was originally inspired by Tempest and Tempest 2000 an Atari Jaguar Game. It was designed using the same concepts but with improved graphics and sound. The game starts out easy and the difficulty slowly rises per level. There are over 100 levels of gameplay, seven different enemies, starting level is selectable and the game can be controlled via the mouse/Keyboard or gamepad. Typhoon 2001 uses OpenGL and Allegro.